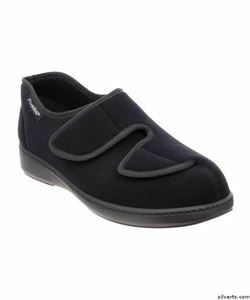 The Athos Indoor Outdoor Shoe / Slipper by Podowell is a Washable Footwear Basic. Secure, comfortable, light with a slip-resistant sole. This shoe features Quick double adjustment adjustable straps which adjusts for swollen feet, swollen ankles and edema. The wide width fits up to a 2E or EE width. The lining is made of Antibacterial bamboo sponge. The exterior is made of Superior fabric in washable microfiber (polyamide microloop). Recommended for: edema, lymphedema, Heel Pain, Arch Pain, Plantar Fasciitis, Ankle Pain, Flat-Feet, Pronation, Metatarsal Pain, Mortons Neuroma, Bunions, Calluses, Corns, Hammer Toes, claw toes, Diabetic Feet, Arthritic Feet, Back Pain and general foot pain. Removable and anti-static insole (microfiber) to accommodate orthotics. Fast drying (air dry)and machine washable fabric (86 Â°F or 30 Â°C). Since 1930 PodoWell has been designing orthopedic footwear to help people with painful foot sensitivities experience more comfort and ease. PodoWell offers a selection of easy to slip on, super light weight, wide-fitting flexible shoes appropriate for in and out door wear. Their washable footwear is ideal for patients suffering from ulceration, neuropathy or edema.